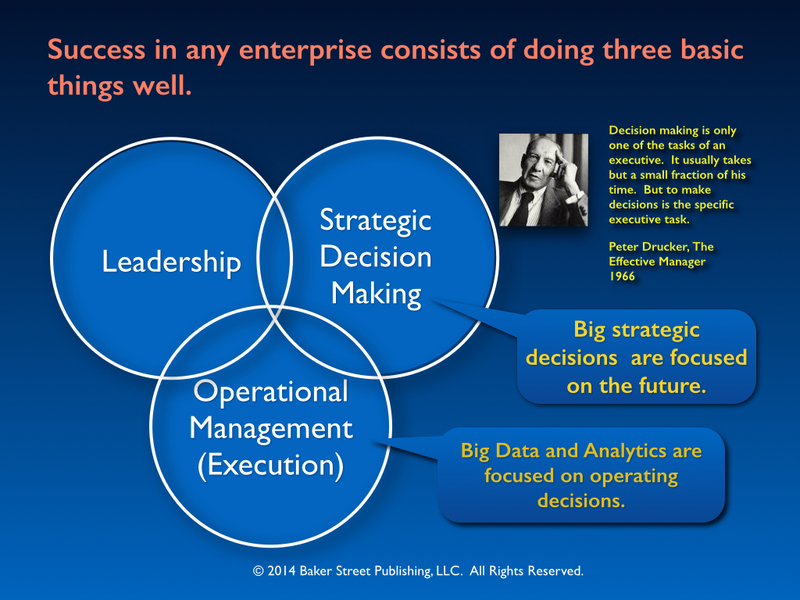 Big data and Analytics are having a remarkable impact on operational decision making. They are helping us do lots of things more effectively; things like diagnosing illnesses, and having the right things in the right places at the right time. Big praise for Big Data. In our enthusiasm for “Big Data” it is good to remember that success in business requires more than good operating decisions. Success also requires making the big, strategic decisions. 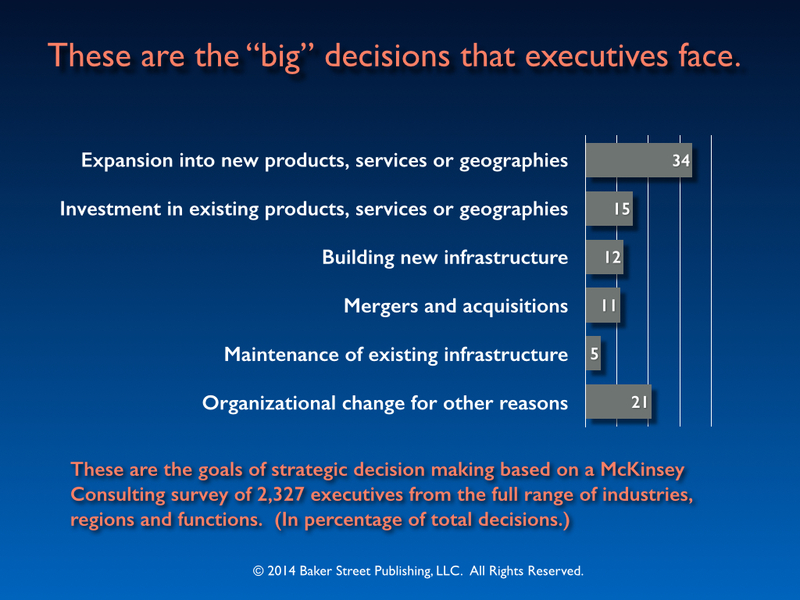 Big, strategic decisions are about the future. Strategy is future oriented. The big decisions that CEO’s face (see the slide on the left) are tough because we don’t have any “data” about the future, big or small. We don’t know how much longer Moore’s Law is going to lower computing costs. We don’t know how much lower the cost of solar panels will drop. Questions like, “Which start-up should we invest in?” ” Which operating system should we commit to?” ” Which technology should we bet on?” ” Where should we drill our next oil well?” ” Who should we pick for the next CEO?” These decisions are forward looking. Data is helpful but it won’t give us the answers. No one knows what is going to happen in the future. 1) Scenarios. We get surprised more than we should because we don’t think broadly enough about the future. The act of carefully thinking through scenarios “limbers up” our thinking about what is possible. We don’t know which scenario is the right one but we can hedge our bets and do some contingency planning. Great military generals are masters at recognizing alternative scenarios and managing their reserve forces accordingly. 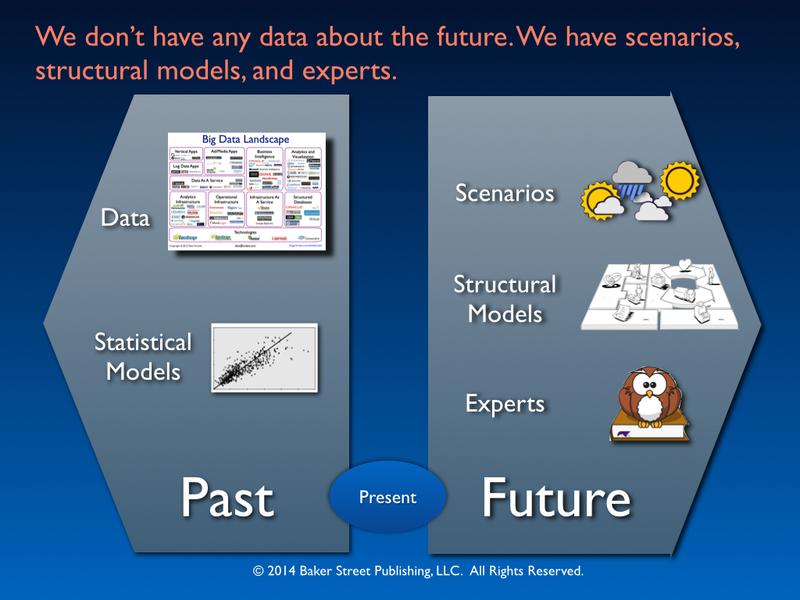 Scenarios can help us avoid the trap of assuming the future will be like the past. 2) Structural models. We can build a business model that captures what we know about the mechanisms and processes at play. We can then experiment with the model to get a sense of what might happen in the future. When there are gaps in the data we can use probabilities to capture our uncertainty in a clear and concise way. 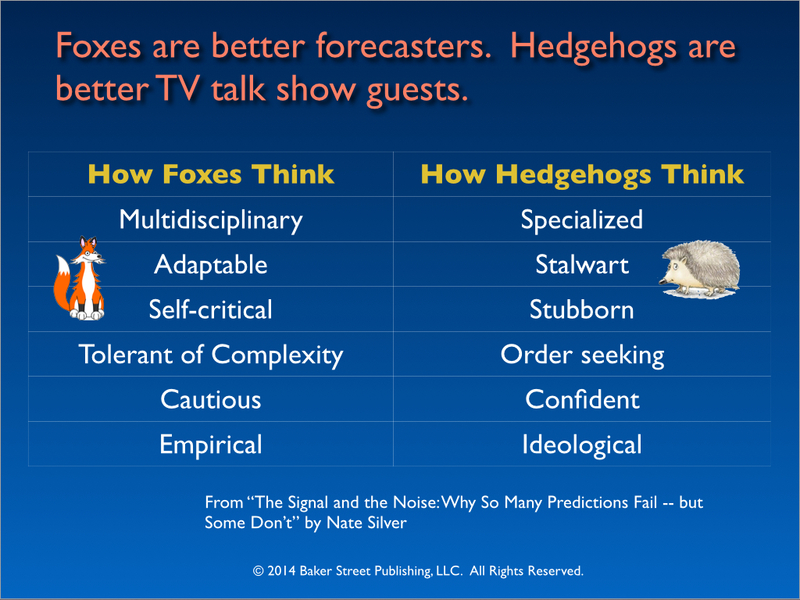 To learn more about using models to forecast the future I recommend Nate Silver’s book, “The Signal and the Noise: Why So Many Predictions Fail — but Some Don’t. Nate Silver’s models are a combination of statistics and structure. If you are new to business modeling then visit the Business Model Generation website. See, “Coach’s Guide to the Collaborative Design Process.” for a case study that illustrates how we can use scenarios, business models, and expert judgment to help decision makers think about the future. See Coach’s Guide to the Decision Analysis Process for the nitty gritty. Baker Street posts about once per month. If you would like to receive posts automatically by e-mail, just submit your address here.